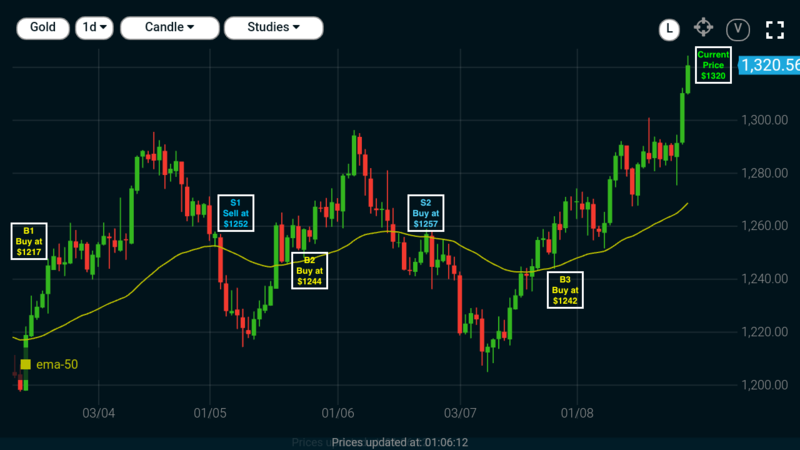 Moving average is a simple technical analysis tool that measures the average price over a specific period of time. It is very useful, as it is the most simple & common technical indicator. Moving averages help traders to analyse current price movement. They do not predict price direction, but rather define the current trend with a lag. The two most popular types of moving averages are the Simple Moving Average (SMA) and the Exponential Moving Average (EMA). SMA is calculated by computing the average price over a specific number of periods. EMA is calculated by computing the average price but giving more weightage to the recent prices. EMA reacts more quickly with less lag and are therefore more sensitive to recent price changes. How to Use Moving Averages? Moving averages are used to identify buying and selling opportunities. “When the prices trade above the moving average, the trend is up and bullish signal is generated.” Therefore you should look at buying opportunities. “When the prices trade below the moving average, the trend is down generating bearish signal.” Hence you should look at selling opportunities. In the below Daily candlestick chart of Gold, 50 day EMA is plotted (yellow line). Starting from the left, the first buying opportunity generated at $1217 (B1). As the gold price moved above the 50 day EMA we initiate a fresh buying position. Going ahead we stay invested till the price goes below the EMA, which eventually went at S1 @ $1252 and we exit the position by capping a profit of $35 (1252-1217). The next signal to buy came at B2 @ $1244, followed by a sell signal at $1257 making just $13. However the third trade to buy at B3 @ 1242 looks very impressive as the current price is at $1320 giving a unrecorded profit of $78. 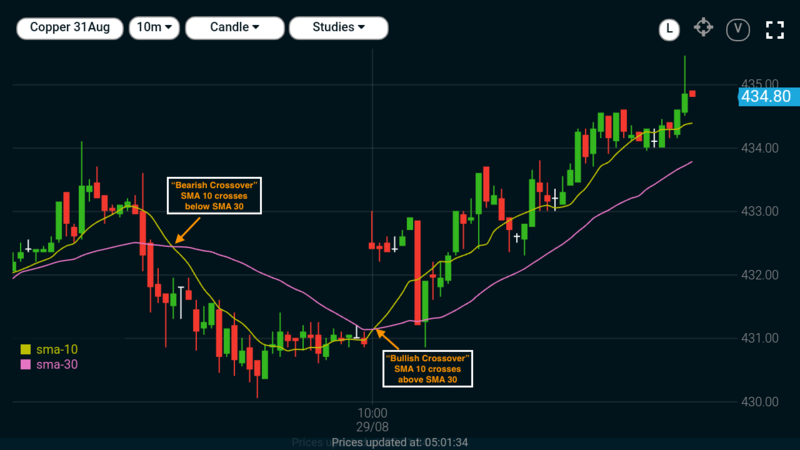 Two moving averages can be used together to generate crossover signals. Double crossovers involve one relatively short moving average and one relatively long moving average. Bullish Crossover (Golden Cross) - This occurs when the shorter moving average crosses above the longer moving average. Bearish Crossover (Dead Cross) - This occurs when the shorter moving average crosses below the longer moving average. The length of the moving average depends on trading time horizon. 200-day moving average is the most popular. Next, 50-day moving average is also quite popular for the medium-term trend. Many chartists use 50-day and 200-day moving averages together. Moving averages can act as Support in an uptrend and Resistance in a downtrend. A long-term uptrend might find support near the 200-day SMA, which is the most popular long-term moving average. Moving averages are trend following, or lagging, indicators that will always be a step behind. This is not necessarily a bad thing though. After all, the trend is your friend and it is best to trade in the direction of the trend. As with most technical analysis tools, moving averages should not be used on their own, but in conjunction with other complementary tools. Chartists can use moving averages to define the overall trend and then use Relative Strength Index (RSI) to define overbought or oversold levels. We will be covering RSI in the next edition of Market Vidhya. मूवींग एवरेज का उपयोग कैसे करें?